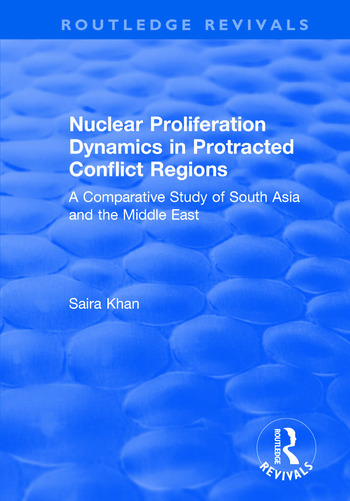 This title was first published in 2003:Using extensive case studies of the nuclear weapons programmes of India, Pakistan, Israel, Iraq, Iran, Egypt and Syria, this important work shows that a higher than normal probability of war in protracted conflict regions, prompts states to search for credible deterrents such as nuclear weapons. The book rigorously examines the factors that affect the pace of this proliferation such as regional power structures and geographical proximity, and challenges many prevailing theories on proliferation. This compelling text convincingly argues that simple conflict relationships are not sufficient for countries to go nuclear, thus providing insight into the true complexity of the issue. Explaining the similarities and differences between the nuclear policies of states in protracted conflict regions, the book commands the attention of anyone interested in nuclear proliferation and regional conflict. Contents: Introduction. Theory: The state of scholarship on nuclear proliferation; Understanding nuclear proliferation; Non-traditional nuclear deterrence among protracted conflict adversaries. Case Studies: The South Asian Protracted Conflicts: The Indian nuclear weapons acquisition; Pakistan’s search for nuclear deterrence; Non-traditional nuclear deterrence in the India-Pakistan protracted conflict; India’s deterrent needs and the Sino-Indian protracted conflict. Case Studies: Middle East: The Arab-Israeli Protracted Conflict: Israel’s opaque nuclear weapons; Proliferation propensities in the Arab states; Arab-Israeli protracted conflict and non-traditional nuclear deterrence; Conclusion; Bibliography; Index. Ph.D. in Political Science, McGill University, Montreal, 1999 M.A. in Political Science, McGill University, Montreal 1992 Adjunct Faculty, Department of Political Science, Concordia University, Montreal (1999-2000). Lecturer, Department of International Relations, Dhaka University, (1988-90).